Let me just say right off the bat that I have never played a Need for Speed game and have never been interested in playing one. I guess my lack of interest was always because running from cops seemed like a hassle (and made me feel like a bad guy) and because I've just never had much interest in cars. As such, I was drawn to less realistic racing games like Mario Kart, F-Zero, and Burnout instead. Burnout led me all the way up to Burnout Paradise, which, while different from previous games and certainly not perfect, kept me entertained for a long time thanks to its focus on exploration and open-endedness. And thus I progressed to Need for Speed: Most Wanted, which is undeniably more of a sequel to Burnout Paradise than it is a Need for Speed game (or so I've heard from people who have played Need for Speed games). But that's just fine with me. Wii U's option for offscreen play leaves the TV HUD-free. Essentially, you've got a nice big city to drive around as you wish and it's filled with billboards and security gates to smash, cars and jack spots to find, speed cameras to trigger, and five challenges to complete for each vehicle. The game keeps track of how many of each thing you've found, encouraging you to go for 100% completion. The road rules, crash mode, and super jumps from Burnout Paradise are gone, but now each billboard tracks stats of your biggest jump through the billboard. Also compared to Burnout Paradise, Most Wanted's controls feel better (I don't spin out when starting any more), takedowns feel less satisfying (a light tap can cause a takedown while strong rams don't, and there's no takedown cam), and crashes in general are less spectacular. Also, now that this Burnout Paradise sequel is a Need for Speed game, cops are in. They feel like a rather unnecessary element though, since there's essentially no penalty for being busted. Due to its open-ended nature, there isn't a whole lot of structure to the game except for the goal of racing and wrecking each of the ten Most Wanted racers (plus one more in the Wii U version). To be able to race them, you have to accumulate points according to your notoriety. You get these points for doing just about everything, including finding the collectibles mentioned above and escaping the cops, but mostly by completing the races and challenges for each vehicle. 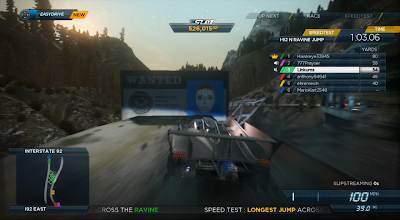 If you're like me, you'll have a few of the Most Wanted races unlocked before even trying. These races aren't really much more exciting than any other race except that the police chase you more aggressively and the difficulty is a bit higher. Sure, you also unlock their cars for winning, but you already have every single other car at your disposal from the start (assuming you can find them in the city), so it's not that big of a deal to unlock the Most Wanted cars. Check out some HD footage from three of my offline races! 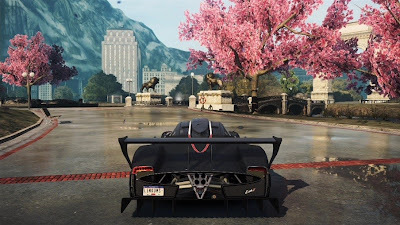 As for the normal challenges with each car, these are mostly races, but there are also challenges to escape pursuing police cars or to get the highest average speed that you can over a particular distance. 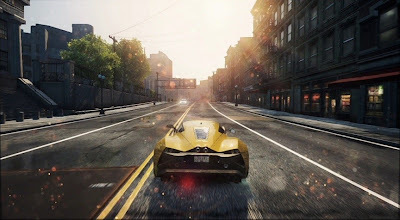 The races are definitely a step above those in Burnout Paradise, which were always racing to one of several locations around the edges of the map. In contrast, the races in Most Wanted take you on more interesting routes through the city, with easily visible checkpoints and a helpful GPS minimap in the corner of the screen. Coming in first or second place in one of these challenges unlocks upgrades for that car which you can equip easily from the EasyDrive menu (from which you do pretty much everything) while driving or immediately after the race. Unfortunately, the upgrades are the same for each vehicle and essentially just give you the choice of sacrificing speed for off-road ability, top speed for acceleration, or speed for durability. The option is nice, but it's quickly obvious that the vehicle customization is very limited. Besides that, if you were hoping to make your car look good, you'll be disappointed to know that all you can change is its color and license plate. It is worth noting, however, that the upgrades unlocked from the challenges can be upgraded further by using them and completing some of the multitude of milestones in the game. For example, you can get rewarded for driving a certain distance in oncoming traffic with a certain upgrade equipped with a certain vehicle. There are general achievements like this for the main game, for each vehicle, and another whole set of achievements and unlockables for online multiplayer. It's nice that there's so much to do, but since you can do it almost any order, it means that the sense of progression is a little out of whack. Just as you're getting good with one vehicle, having progressed through its easy, medium, and hard challenges, you'll find that you're out of challenges and need to move onto a new car, once again going through easy, medium, and hard. Apart from the Most Wanted races, the difficulty doesn't and can't really progress with your skill level and, instead, oscillates between easy and difficult. The Wii U version also makes use of Miis for previously smashed billboards. Online multiplayer surprisingly brought a bit more variety in challenges, which made me wonder why these things weren't also challenges in single player. I guess it's probably because of their simplicity; many are simply competing to get the most air off of a particular jump or racing around a shorter figure-8 track. The challenges come in sets, so you can compete to be first overall. Between each challenge, you'll be notified of the next meet-up point and getting there becomes a race in itself. As mentioned, online multiplayer has its own set of achievements and unlockables, meaning that your accomplishments in single player won't carry over here. Instead, you'll earn upgrades and new vehicles by completing milestones and simply by playing more. There are also many unlockable designs for your license plate which are shown off whenever you take down an opponent. Playing online requires a free account through Origin. Also, the police are mysteriously absent from the online mode, though this offers a welcome break from their somewhat repetitive radio chatter. The bigger disappointment is that, once again, there is no offline multiplayer. Boo. + Everyone has a microphone, though most don't seem to use it. + Slightly better graphics, or so I've heard. - Availability of other DLC is dependent on this version's sales, making it unlikely. - Online multiplayer only supports six players instead of eight. - Wii U has no console-integrated achievements. Need for Speed: Most Wanted U is incredibly fun, but it isn't for everyone. If you need more direction in your games, you might find yourself just wandering around, wondering what the point is of it all. Furthermore, if vehicle customization is important to you, Most Wanted is going to leave you disappointed. If, on the other hand, you just want a sequel to Burnout Paradise, this is the game for you. It has some room for improvement, but it's still a darn good game in its own right. Are you a fan of racing games? Maybe you'd be interested in the improvements I'd make to Mario Kart or the criminally overlooked Excitebots.